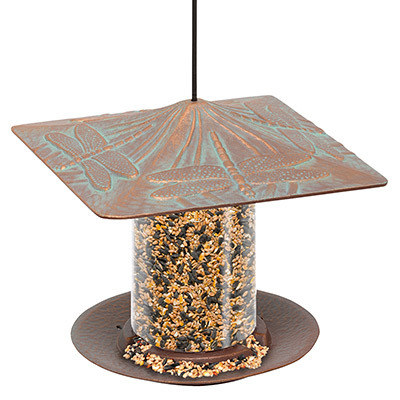 Celebrate marshlands and add style to your bird garden using the Whitehall Dragonfly Tube Bird Feeder. This intricate feeder brings dragonflies to the forefront in your yard, with its bold color scheme and exciting detailing. Three dimensional dragonfly shapes adorn the roof, while its copper colored background and verdigris accents enhance the figures. This 9.5", square roof leads to a clear plastic seed tube, which holds up to 1.2 quarts of seed. Use mixed seed to attract a variety of birds, or use safflower seed or peanut splits for more specific bird feeding. A metal base attaches to the bottom of the seed tube, with three depressions here allowing seed to exit onto it. The 8" diameter of the base creates plenty of perching and dining area, while drainage holes help seed remain dry. The aluminum construction of the top and base will not rust, and also remains sturdy and lovely for several seasons. A metal rod through the center of the item adds stability, and culminates in a loop to hang the feeder easily. Lift the roof up this rod to fill the item in moments. Add several types of flying creatures to your yard with this Dragonfly Tube Bird Feeder. Made in the USA.